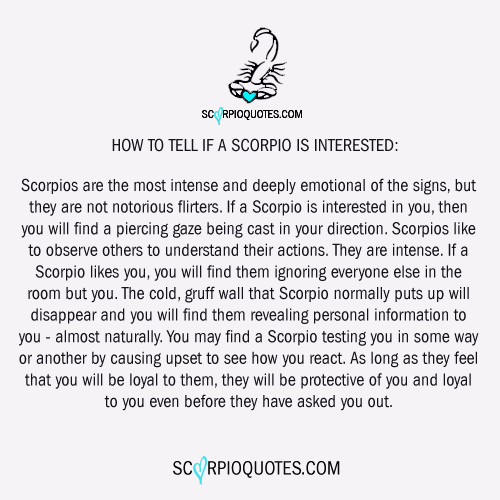 Scorpios are the most intense and deeply emotional of the signs, but they are not notorious flirters. If a Scorpio is interested in you, then you will find a piercing gaze being cast in your direction. Scorpios like to observe others to understand their actions. They are intense. If a Scorpio is interested in you, you will find them ignoring everyone else in the room but you. The cold, gruff wall that Scorpio normally puts up will disappear and you will find them revealing personal information to you - almost naturally. If they're interested, you may find a Scorpio testing you in some way or another by causing upset to see how you react. As long as they feel that you will be loyal to them, they will be protective of you and loyal to you even before they have asked you out.